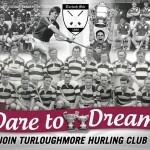 Posted December 22, 2009 by Emmet Farrell in News. Galway City Karate Club Instructor Sensei Greg Cotter hosted Christmas competition for its senior members on December 17th and invited some members of Claregalway and Turloughmore Karate clubs to attend. Claregalway was represented by Dave Giles while Turloughmore was represented by Anthony Lawless and Evan Flaherty, while Sensei Pat Kelly (Claregalway) was invited to referee with Sensei Cotter. The compeition was held in Shantalla Dojo in Galway city. There was an excellent display of Karate skills by all Karateka with a good mixture of kicks,punches and sweeps which were used to score some ecellents points. 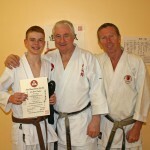 and 3rd Shane Cummins (Galway Karate club). 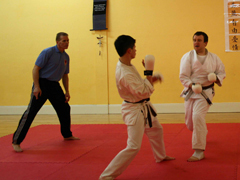 Claregalway Karate Club train every Wednesday in the SMA house @ 6:45pm and also in Turloughmore community centre on Mondays @ 6:30pm. Below is a selection of images from the event, and as usual, you can add your own using the link below.